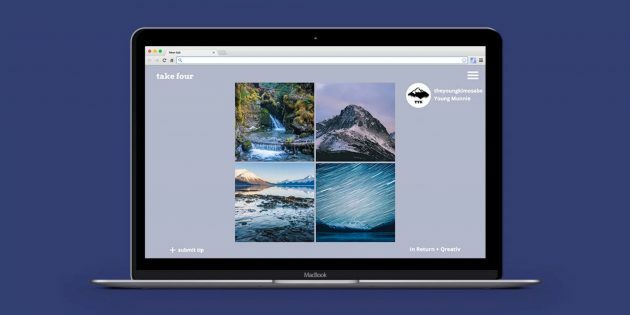 Take Four – is a new extension for the Chrome browser, which is designed to demonstrate the art of spectacular images from the Instagram . After installation Take Four in front of you will appear on the four pictures of one author each time you decide to open a new browser tab. It’s no secret that the most interesting and beautiful in the network is concentrated in Instagram. Of course, I am not referring to the masterpieces in the style of “my cat”, “my dinner,” or “my news”, but real works of art. Take Four Extension for Chrome will allow you to join the true photography. Clicking on any of the photos you are transported back to the page it contains the Instagram . If you want to get acquainted with the work of the author, it is necessary to click on his avatar in the upper right corner. I do not know how selection works snapshot algorithm, but Take Four photo shows phenomenally beautiful. So beautiful that you will want to share them with your friends. To do this, you can use the drop down menu, with which you can send your favorite selection in Facebook, Twitter, Google+, or just copy the link. Expansion of Take Four will, I hope, appreciated by all lovers of quality photography.If you want even more beauty to a new tab in your browser, you get acquainted with this review .